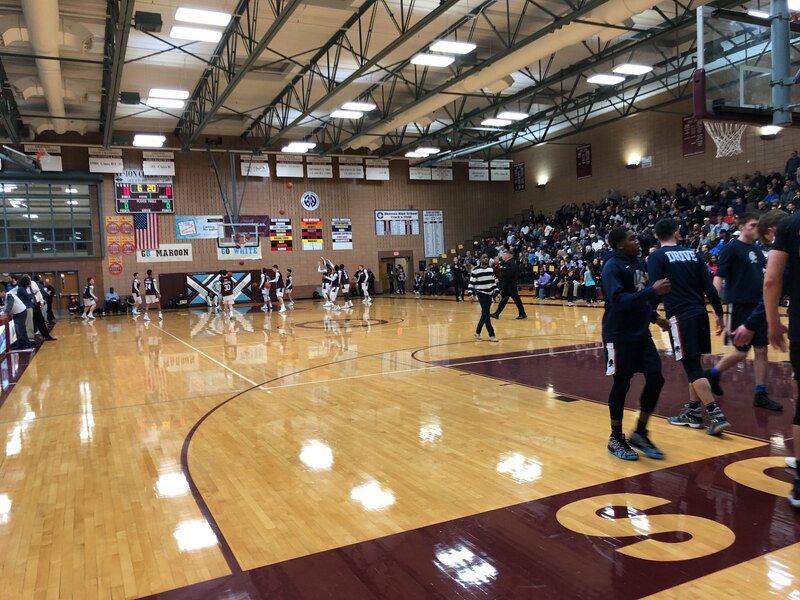 OKEMOS - Before the season begun, Jeff Wonch, the Head Coach of the Okemos Boys' Basketball Team, told his players that they were going to take the program to the next level. The Chieftains did just that when they captured the 2017-2018 CAAC Blue Conference title with a 64-56 victory against the East Lansing Trojans. "I told them, this is the next step," said Wonch after winning the conference title for the first time since 2011. "They're the guys that are going to take the program to the next level. Winning the league championship is everybody's goal, and we were able to do that. The Chieftains took control of the game early. They hit four 3-pt shots in the first quarter with one of them resulting in a four-point play after Senior Gerald Sambaer III was fouled. The Chieftains would go into the second quarter with a 20-14 lead. However, the Trojans, who won the last three CAAC Blue Conference title, would start the second quarter off much more aggressive. East Lansing's senior star Brandon Johns led all scorers with 25 points and would help East Lansing take the lead for the first time in the game but going into halftime the game was tied at 27. Going into the fourth quarter it was a tight game with several lead changes. Both teams were also in foul trouble. East Lansing's senior forward Justin McAbee fouled out late in the second half and Okemos Junior Evan Thomas kept being subbed in and out after picking up his fourth foul. However, the Chieftains took advantage of going to the line and was able to stretch their lead and win the game. "We practice [pressure free throws] all the time to be able to be in this position," said Thomas who led all Okemos players with 17 points. "We feel at home so when we step up to the line we are ready." With the gym packed, Okemos was able to use their home court advantage to help win the game. There were loud chants of "Go Maroon, Go White" between the student section and the cheerleaders resembling the Michigan State University 'Go Green' chant. "All credits to our student section, and parents and everyone who came out to this big game," said Thomas. "We advertised this game a lot. It was great to have all this energy in the crowd. Okemos' next game is Thursday, March 1 at 7p.m., where they will play St. Johns High School. The team will also be celebrating their senior night.